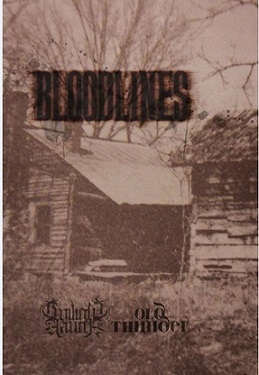 This is a review of a split cassette between Tennessee's Twilight Fauna and Kentucky's Old Thunder called "Bloodlines" which was released by Into The Night Records and we will start off the review with Twilight Fauna a solo project that has been featured before in this zine and plays an atmospheric form of black metal. Nature sounds start off his side of the split along with some acoustic guitars and clean singing vocals that give the music an Americana feeling and after awhile flutes are added into the song and they also bring in more elements of folk music and on the following track which is also 13 minutes in length the music adds in electric guitars which also take the song into a heavier direction along with some grim black metal screams that kick in after awhile, the acoustic guitars from the first track are also used briefly on the second song while the heavier parts stick to a slower style of black metal, the production sounds very dark and raw while the lyrics cover nature, human spirits and old gods themes. In my opinion this is another great sounding recording and if you are a fan of atmospheric black metal with a touch of folk music, you should check out his side of the split. RECOMMENDED TRACK "A Revelation (Conceding The Scars)". Next up is Old Thunder a solo project that plays an atmospheric mixture of doom and sludge metal. A very distorted yet melodic sound which also gives the music a post metal feeling starts off his side of the split along with some clean playing and after a minute heavy doom metal guitars and grim sludge style screams which also have a touch of black metal to them are added onto the recording while the melodies also stick around in both the leads and riffs and all of the musical instruments have a very powerful sound to them and the songs also bring in a great mixture of both clean and heavy parts, both of the tracks are very long and epic in length and the production sounds very dark and raw while the lyrics cover suffering, Appalachian Life, Faith and Literature themes. In my opinion this is another great sounding recording from Old Thunder and if you are a fan of atmospheric sludge and doom metal, you should check out his side of the recording. RECOMMENDED TRACK "Burnt Bone Garland". In conclusion I feel this is a very great sounding split and I would recommend it to all fans of the more atmospheric sides of black, doom and sludge metal. 8 out of 10.